Pop-top cans and twist-off caps are convenient, but many premium beverages still sport the traditional crimped-on bottle cap. A quick peek into our refrigerator found two brands of soft drinks, a hard lemonade, a pale ale and two lagers -- all in glass bottles with a metal bottle cap pressed firmly in place. No amount of twisting will remove these caps. So how do we release their refreshing liquid goodness? It's easy to take the ubiquitous bottle opener for granted -- right up to the point when you want to pop the top off of a crimped cap. Most kitchens have several different types of cap lifters stashed away in a drawer, but what if you're camping, hanging at a barbecue, or out fishing? My tool of choice has been hanging from a key chain since the mid-1970s. 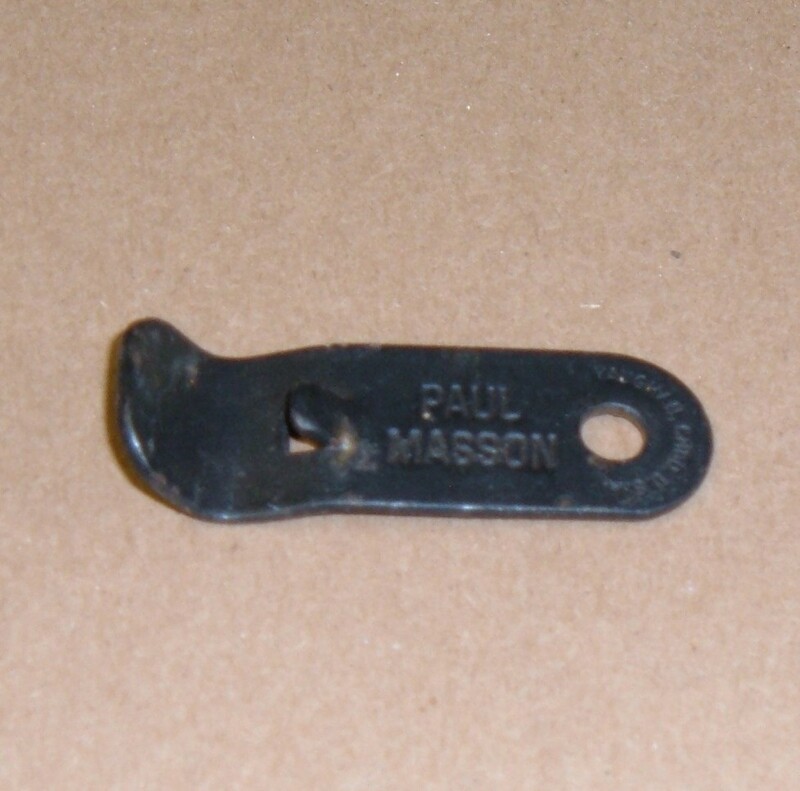 Stamped with the Paul Mason logo, the little bottle opener was an advertising give-away from a liquor salesman that stopped by the family store. From popping beers on the beach at night, through a college party or two, out on fishing trips and into backyard get-togethers, this little opener has removed countless caps over the years. The original chrome finish is long gone, and the metal endured several resprays of paint. As the photo shows, the little opener is overdue for a fresh coat. Before the 1850s, most bottles were sealed with wooden or cork stoppers. The first screw off cap is introduced in the 1850s. Around the same time, beer brewers began to use porcelain stoppers held in place with a wire bail to seal their bottles. William Painter invented the Crown Cork style of bottle cap, and patents his new design in 1892. Very similar to today's bottle cap, Painter's original design crimped a metal cap over the bottle opening. Two years later, William Painter patents the Church Key cap lifter to remove Crown Corks bottle tops. In the early 1900s, beverage production increases dramatically and nearly all bottling companies adopt the Crown Cork crimp style bottle cap. With the increased manufacturing and sales of beverages in crown capped bottles, the need also increased for the specialty tool to remove the cap from the bottles. A plethora of Church Key openers hit the market, many sporting the logos of breweries and soft drinks. 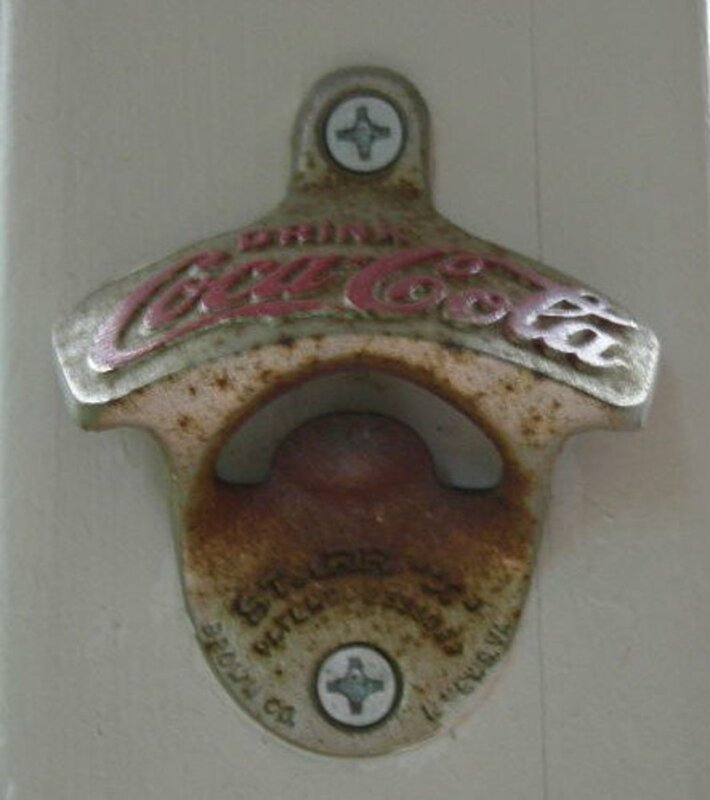 In 1925, the wall mounted bottle cap opener makes it easy to pop off the top using just one hand. Since William Painter invented the Crown Cork bottle cap, and then patented the first tool to open this new cap in 1894, tens of millions of bottle openers have been produced. The earliest bottle openers resembled small keys, with the Church Key style opener on one end and a hole on the other so it could be attached to a key chain or hung from a hook on the wall. 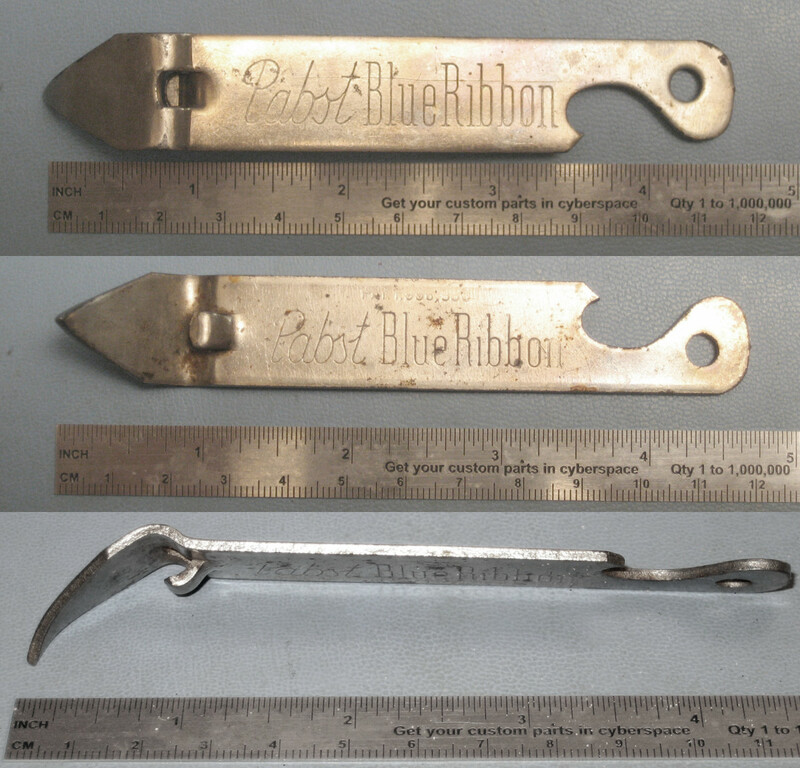 Cheap and easy to make, many early openers were simple metal tools embossed with advertising for beer, soda pop, restaurants and bars. Advertisers saw the potential for publicizing their brand through this inexpensive tool, hoping to have their bottle opener hanging from every key chain and on kitchen wall hook. Beyond the utilitarian tool, openers were shaped like animals, figurines, boots, hats, bottles and countless other shapes, and made from brass, cast-iron and steel. Other openers were made to commemorate special events or as souvenirs for tourist and travelers. 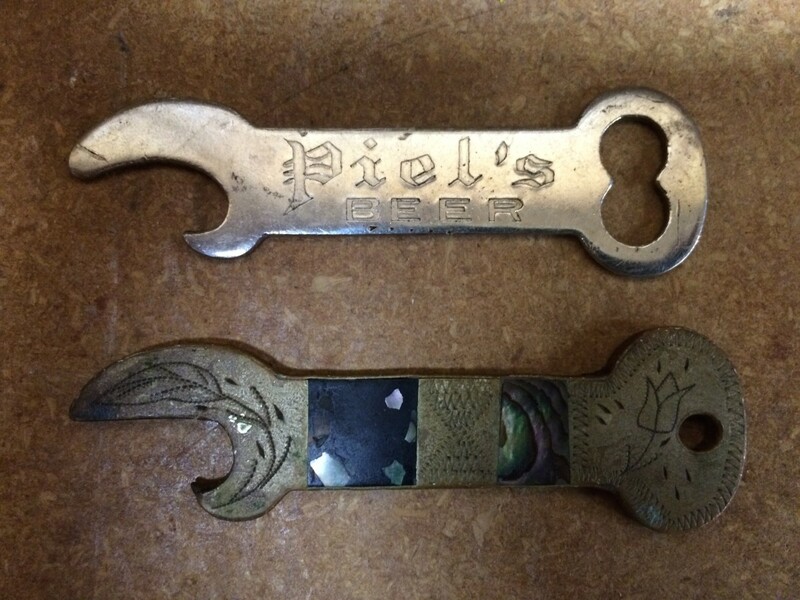 Many of these original bottle openers are as collectible as they are interesting -- though it can be difficult to distinguish a vintage piece from a contemporary copy. Very similar to the original Church Key designed by William Painter in the 1850s, this little opener was probably made in late 1950s or early 1960s. Embossed with the Piel's Beer logo, this cap remover is easy to use: grasp the bottle firmly in one hand and the opener in the other. Hook the lower jaw of the Church Key into one of the cap tines and with the top centered on the lid of the bottle cap, lift the opener upwards. The cap pops right off. Church Keys are interesting collectibles, and they are commonly available at yard sales and flea markets for just a dollar or two. Older Church Keys can be quite valuable if you are fortunate enough to find an authentic antique. For the most part, the fun is in the hunt to find an opener sporting the logo of defunct soft drink or brewery such as Piel's Beer. Easy to use and inexpensive to manufacture, this style of opener uses the same lever action as the Church Key to lift off a bottle cap. The opening has two little lips for hooking under the edge of the cap (back towards the "V" portion of the opening near the handle) while the metal bar across the front on the opening rests on the bottle cap. To lift off the cap, hold the bottle firmly in one hand and the opener in the other. Hook the lips of the opener under the edge of the cap and with the front edge of the opening positioned on the bottle cap, lift the handle upwards. The fulcrum action pops off the cap. 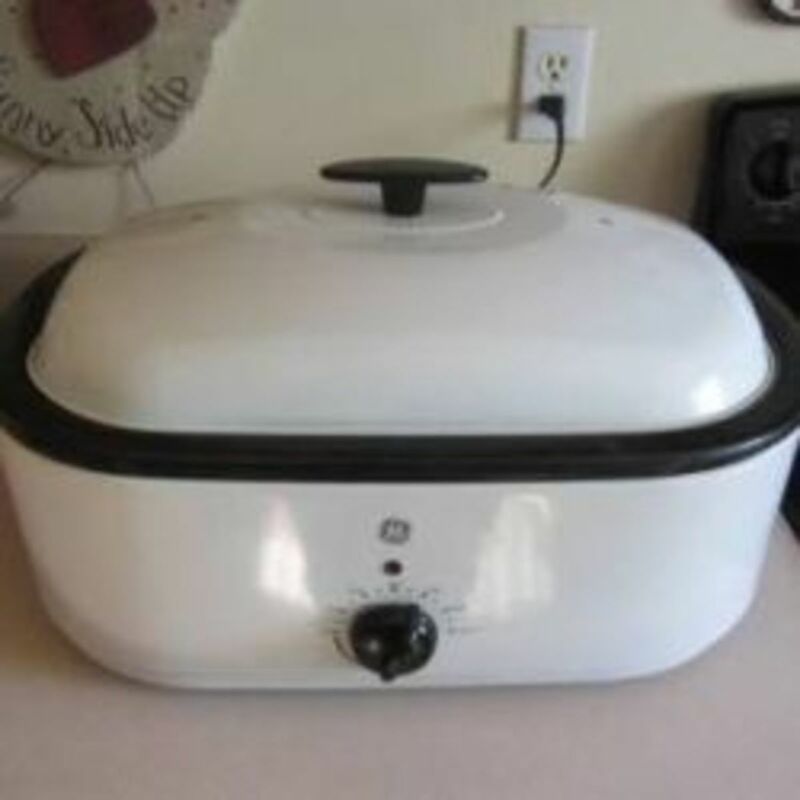 The pop top opener pictured here is a contemporary, inexpensive and massed produced item. We have several of these openers hanging in strategic locations around the house and in the garage, in the garden shed and in my tackle and tool boxes -- just in case the need arises to pop open a cold refreshment. The wall mounted bottle opener uses the same lever action as the Church Key cap lifter but with one major advantage: you only need one hand to pop off the cap. The expended cap falls into a cap catcher positioned under the opener, or perhaps down onto the floor. The old-time soft drink coolers often had this style of cap remover integrated into the cabinet. After purchasing the bottled drink and removing it from the cooler, the bottle top is positioned in the opener. 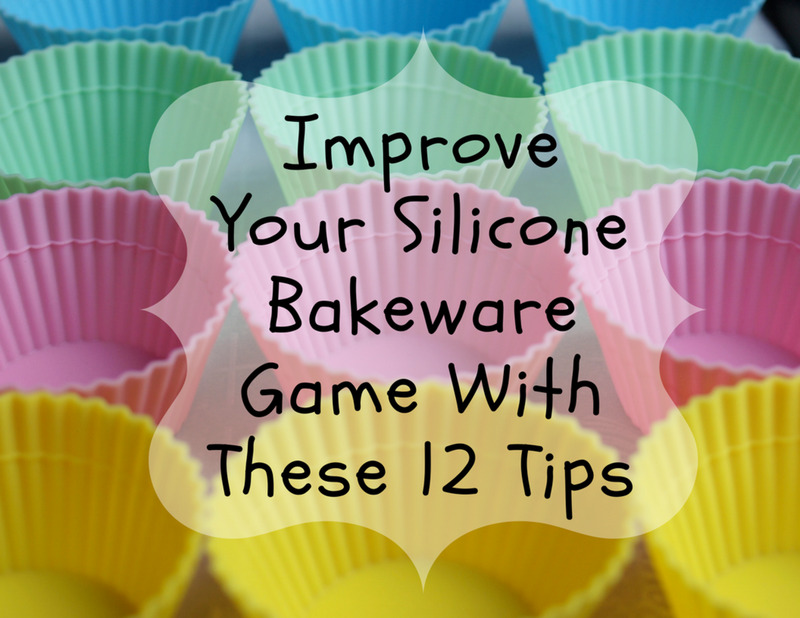 A quick flick of the wrist, and the cap pops off and drops into the cap catcher. 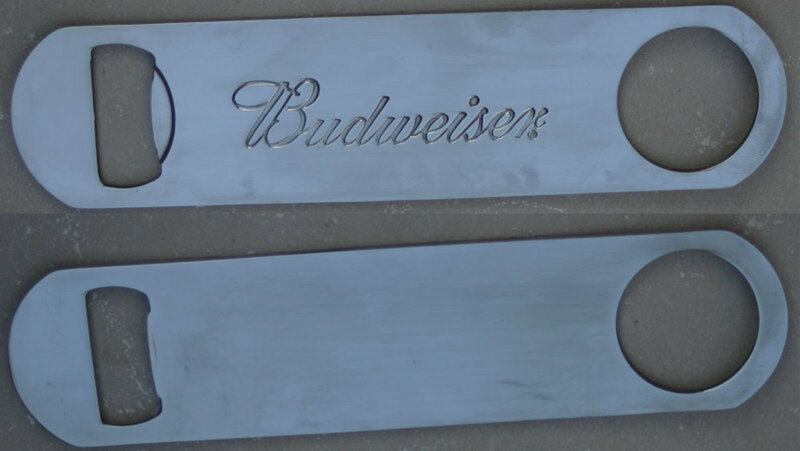 Wall mounted bottle openers are still popular and manufactured today, and vintage wall mounted openers are also quite common and easy to find at garage sales and flea markets. 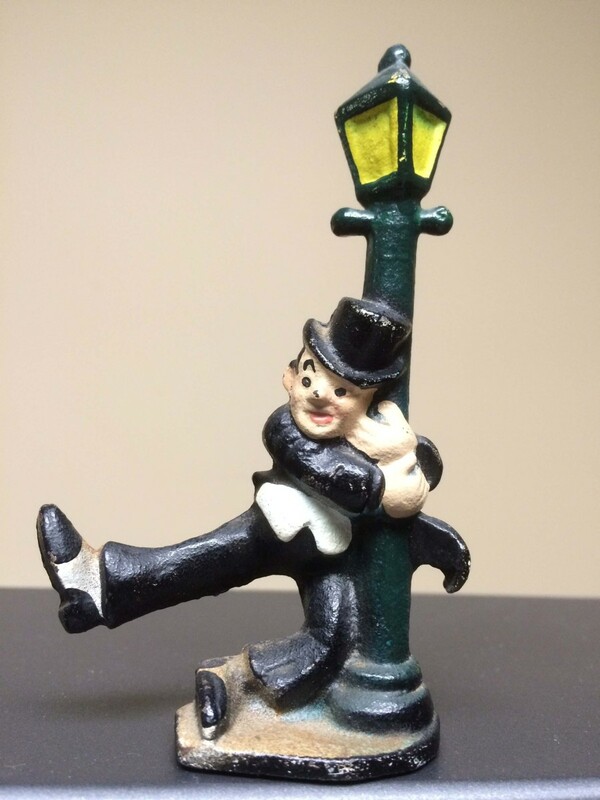 Though this may not look like a bottle opener at first glance, a closer inspection reveals a hooked cap lifter on the lower right side of the lamp post. This unique little opener is made of cast-iron, and it is probably from the 1930s or 40's. The figurine is hand painted, and it is about 4 1/2 inches tall. Cast-iron bottle openers were made in a variety of designs, and you can find vintage openers in a wide variety of shapes including owls, anchors, mermaids, fish -- even miniature replicas of the Eiffel Tower. Like the little fellow hanging on to the lamp post, many of these cast iron designs cleverly disguised their utilitarian function of popping tops and opening bottles. 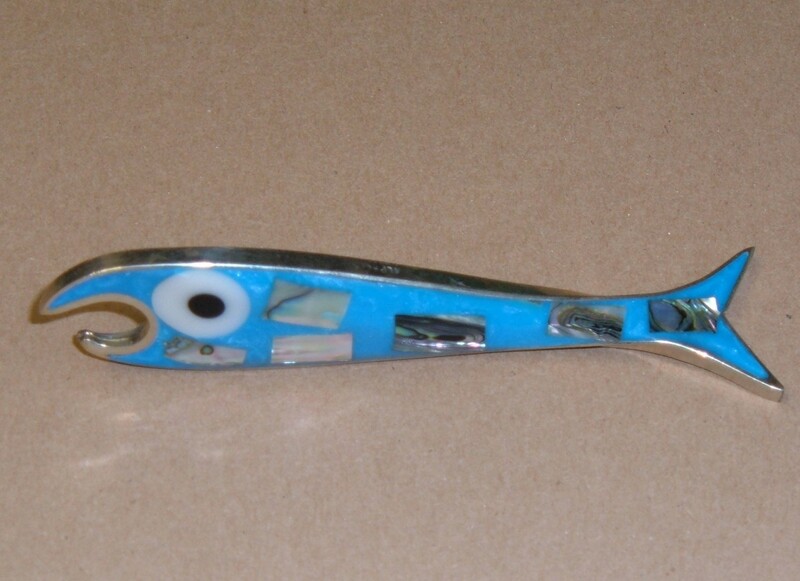 Novelty Bottle Openers come in so many shapes and styles, and are made from many different types of materials.This little fish is shaped from turquoise with embedded bits of stone and trimmed in silver. Made in Mexico, it is primarily decorative as its Church Key jaws are too soft and twist under pressure. The little fish opener rests in a kitchen drawer, bringing back pleasant memories of that trip every time I see it. But it would be nicer if it worked better. 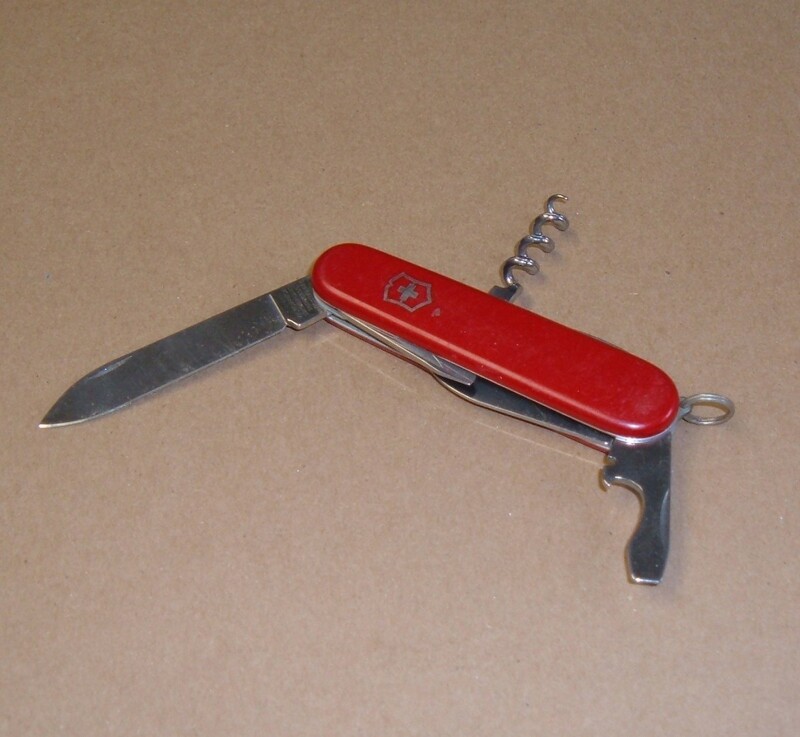 Ask anyone who owns a Swiss Army pocketknife to name the functions of the multiple blades. Odds are that even if they can't remember all of the different blades or how to use them properly, they will recall the little Church Key style opener. Adding a bottle opener to a pocketknife, or to a Waiter's Friend (the folding combination corkscrew, knife blade and bottle opener) or a multitude of similar multi-functional pocket tools is a convenient and inexpensive addition to the tool. The number of blades and the jobs that they perform is nearly limitless. Small, portable and efficient: three good reasons for carrying a key chain opener on ummm, ... on your key chain. My little bottle opener is well traveled. From my very first car to the old truck parked outside in the driveway today, this opener outlasted many vehicles and moved between many different key rings. After a little scrubbing and a new coat of paint, it will be ready for several more years of reliable service. Or maybe I should get it chrome plated. Introduced in the 1950s, speed openers are the bartender's best friend. The flat bar design of the speed opener is large enough for the busy barkeep to grab quickly, and light-weight and easy to manipulate for popping off bottle caps quickly and efficiently. The wide slot on the speed opener makes it easy to slip the business end of the opener over the top of the bottle, while the round hole on the opposite end can slide down the neck of a frosty bottle to pull it out of the ice bucket. Vendors looking for marketing opportunities also love the wide, flat speed opener bar that offers lots of space for product logos and catchy slogans. 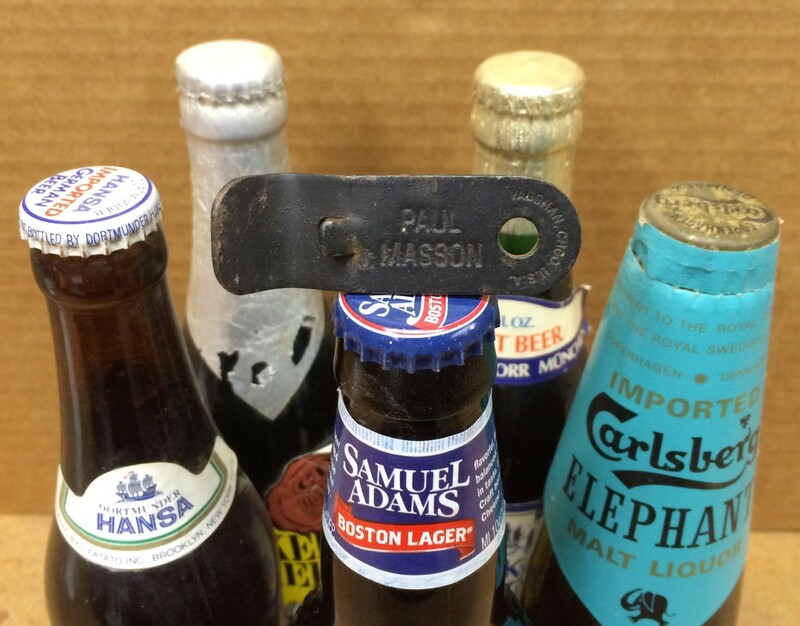 Do You Have a Favorite Bottle Opener? Which type of opener do you prefer? Sure, there's a bottle opener on my key chain right now. I've collected a few favorite openers and vintage cap lifters. My kitchen drawer has several openers to choose from. There's a magnetic opener stuck to the frig. No need. My refreshment of choice comes in a can. After you pop the top off several bottles, see if you friends can solve this Bar Bet Riddle. The solution is easier than it appears! Who Invented the Crown Cap Lifter? William Painter patented the crown top bottle cap, but did he actually invent this ingenious device? This interesting article makes the case that Alfred Louis Bernardin's Bottle Cap Company may have submitted their patent request first. If you collect beer advertising openers or corkscrews, this is the web site you have been looking for. Through Just for Openers (JFO), you "open" new resources of information and access to other collectors. I like the keychain version. I had to get one myself after a particularly stressful work trip to Los Angeles. In the hotel after a long, hot, stressful day, I had a six pack of beer and no way to open a single one of them! I ended up using a drawer handle, McGyver-style. After that trip, I swore I'd never travel without an opener. really great lens nicely done! That bartender was very skilled! My bottle openers are not really that original but it would be fun to have some special ones to the right occasions.